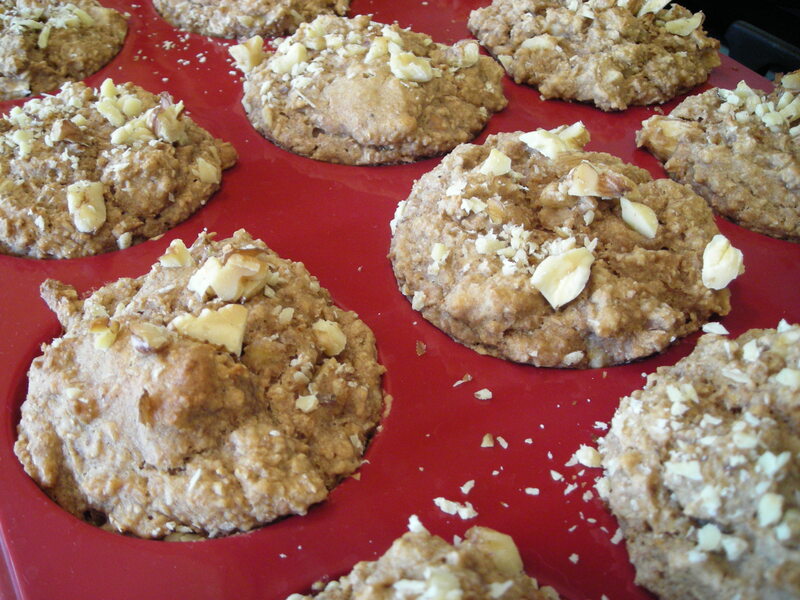 Last Sunday morning our friends Mark and Gwen and their son Ethan came over for apple muffins fresh out of the oven. My mom gave me a stack of recipes to test for a cookbook that’s in the works, and this spiced apple muffin one was so appealing that I had to try it at the first opportunity. I love muffins that at least seem healthy, rather than the mini cakes that muffins have become. 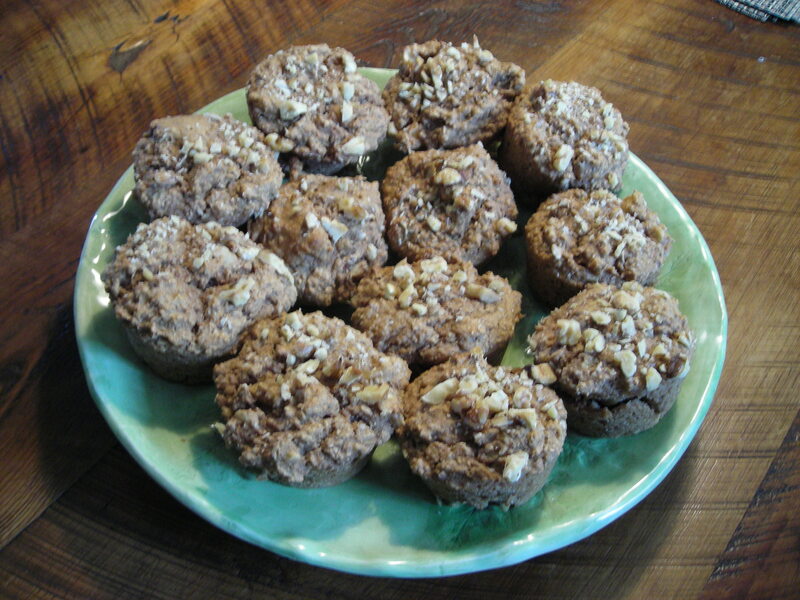 These muffins are quite healthy, full of fiber, and with only a hint of sweetness and a tiny amount of oil. 1. Preheat oven to 350 degrees and have ready one 12-section silicone muffin pan or line two six-section muffin tins with muffin baking papers. 2. Combine the soymilk and vinegar in a small bowl, stir well, and set aside. 3. In a large bowl, combine the whole wheat pastry flour, bran, walnuts, brown sugar, baking powder, cinnamon, nutmeg, allspice, salt, and baking soda. Mix well and set aside. 4. In a medium bowl, combine the bananas, apples, canola oil, and vanilla. 5. In a small bowl, combine the egg replacer and water as directed on the package, and beat with a fork until foamy. Add the foamy egg replacer to the apple and banana mixture and stir in the soured soymilk. 6. Add the wet ingredients to the dry ingredients and mix until the dry ingredients are just moistened. The mixture may still be slightly lumpy. 7. Spoon the batter into the prepared muffin pan, slightly overfilling each cup. Top each muffin with a sprinkle of the chopped walnuts and bake for 25 to 30 minutes, or until the muffins are firm when the tops are lightly pressed. Serve warm with a hot cup of tea or coffee. This entry was posted in Breakfast, vegan by Amy. Bookmark the permalink.